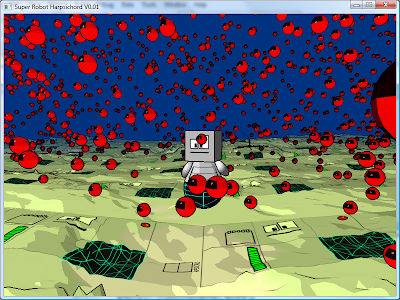 OK, the basic version of the world collision physics is now up and running. This takes the overall bounding circle of the player's ship and uses that as a collision object, as shown in the video below. - Perform physics collisions with each ship component. - Apply damage to the components based upon the collision energy. - Add visual effects, such as a spark stream if the ship is scraping along the side of a wall. Basic Environment Collision Physics from Darren Myatt on Vimeo. This video demonstrates the initial drag/drop ship editor interface in action. It shows that each ship component has a number of slots that can be used to attach either other structural components or weapons. This video starts after the two wing elements and one of the engines have already been added (due to FRAPS time restrictions) - you then see the addition of a couple of power generators, which provide increased power recharge rate and power maximum (which is consumed by firing weapons), a missile launcher and a couple of standard energy cannons. The angle of any of these components may be changed by dragging with the right mouse button, so you can create rear-facing/side facing weaponry as desired. As development progresses, there will also be computer-controlled turrets that will auto-target enemies. Juggernaut Ship Editor Demo Video from Darren Myatt on Vimeo. OK, while I'm putting off a bit of particularly annoying refactoring, I thought it may be a good time to post a quick reflection on how far Juggernaut (and I) have come so far. I quit my previous job (as a technical consultant at a defence subcontractor) on the very first day back this year, because I simply couldn't do it any more. Monetarily it was a pretty good job, which is how I can now afford to do this, but I got no satisfaction from it and the pressure nearly drove me crazy. I'd been working on the code that became the Juggernaut engine for about a year in my spare time (including long periods of nothing) before then: it initially started out as the engine for a 3D game named Super Robot Harpsichord which, who knows, may one day still get made. However, it quickly became clear that attempting to create a full 3D game on my own was completely infeasible in terms of art assets, at which point I came up with the basic idea for Juggernaut, although it has evolved a lot since the initial conception. The Super Robot Harpsichord graphic engine at the time when work was stopped. Notice how everything has the same texture, a constraint that I quickly removed when creating Juggernaut! The red spheres are a large number of test bullets that bounce around the scene. So, after fully leaving my last job on the 5th February, I have been working on Juggernaut (more than) full time. It is still quite ambitious (something warned of by MrMacguffin), but I am trying to keep to deadlines, and progress has been rapid. My original plan was to make a first demo in May, and I think I'm still reasonably on target for that, although it's now going to be the end of May. It's certainly going to be an alpha release rather than a beta, but hopefully it should demonstrate enough of the concepts of the full game to get people interested. The first high quality Alpha video! Yes, it's finally here, I've managed to make a video that doesn't look like arse! Alas, the free version of FRAPS only allows clips of 30 seconds, and this video doesn't necessarily show off anything to the best effect, and the sound is knackered, but it's at least a start. Now that I'm confident it produces good results, I'll upgrade so that I can record full videos. The video demonstrates the laser weapons and the force-applying missiles with space-warping effect. There's also going to be a graphical explosion effect for the missiles, but that hasn't been implemented yet. Also, note that the Scourge aren't bothering to attack the player in this video as the AI is just set to do a patrol loop. In the actual game they'll turn and start following/attacking the player once spotted. Juggernaut Alpha Demo 1 from Darren Myatt on Vimeo. FRAPS vs CamStudio - Fight! Up until now I've been using CamStudio in order to produce videos, as I'd used it before on my Neuromantic post-doctoral project to produce tutorial videos. However, as you've seen, the results thus far have not been so great. Luckily, my friend Mark reminded me of the existence of FRAPS recently, and having downloaded it and done a quick test I can confirm that FRAPS is much, *much* better, and can easily handle 30FPS capture without slowing the game down. So, you can all expect some much higher quality Alpha videos soon! Huzzah!